Over 100 million viewers watch the Super Bowl on CBS every year. And like all seasons, this time too, all eyes were not only on the American football game but the viewers were also eagerly waiting for the creative and thought-provoking ads the halftime had to offer. The advertising industry is indeed celebrated during the premiere of the game. The average cost of a 30-second spot was reportedly $5.2 million and the films had to capture audience's attention in a small time frame. There was indeed a level of competition among the brands to stand out. This year, it seems the brands did not want to spark any controversy with the commercials and just leave the consumer with a strong message and invoke brand recall. 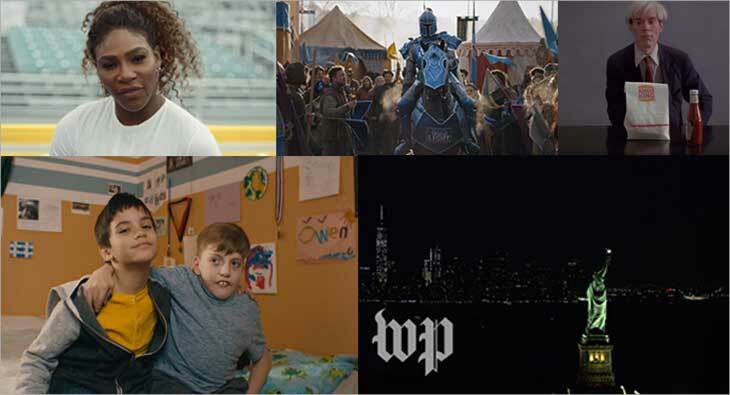 exchange4media takes you through the popular advertisements that were played during the 53rd Super Bowl. This commercial aired during the first half of the big game. The ad, titled ‘The ball is in her court’, features Serena Wiliams, the global ambassador of the Bumble app. The creatives of the commercial were done by FlyteVu. Through Williams, the ad left a message that women ought to take control of their own stories. The Bumble app has been supporting feminism ever since its launch in 2014, encouraging women to make the first move. This ad commercial indeed creates more hype for the show especially at a time when everyone eagerly awaits for April when the final season of Game of Thrones releases on HBO. Based on the show's theme, the brand raised a question for its viewers: What would you do if you were on the throne? The ad showcases a Bud Light Knight character getting brutally crushed by The Mountain at the battlefield. It had a Khalesi dragon flying across the sky with the GOT-themed music playing in the background. The tagline stated: When everybody plays, we all win. Indeed, it is a win for children with disabilities who want to be a part of something and not feel like they are different. This new controller (Xbox adaptive) gives them the power to feel inclusive. Microsoft has returned to the Super Bowl commercials after a four-year break. This short commercial by The Washington Post newspaper had such an impactful message. It honoured journalists such as Jamal Khashoggi and many more who have reported during the war, social and political marches and natural calamities. Members of the press are the ones who risk their lives to keep the people informed. The ad copy is creatively written, saying: Knowing empowers us, knowing helps us decide, knowing keeps us free. This commercial had old footage of the legendary Andy Warhol. The ad inspired nostalgia using footage of the cultural icon. The commercial was simple with Andy eating a Burger King Whopper for his Super Bowl commercial moment. It showcased Andy pouring a good amount of vintage ketchup and eating it along with his Whopper. It was indeed a vintage #ThrowBackThursday moment. Burger King’s message was that once the Whopper is out of the bag, keep eating it like Andy.